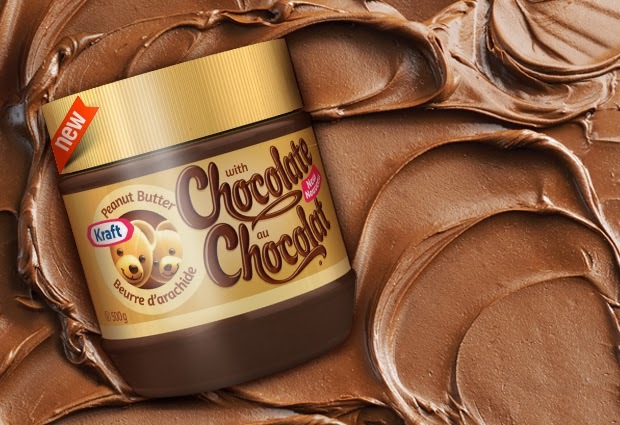 There's a new PB in town: Kraft Introduces new Peanut Butter with Chocolate! We are a peanut butter family and not just any peanut butter - it has to be Kraft Peanut Butter. For over 50 years, Kraft Peanut Butter (also known popularly as Kraft PB) has been Canada's favourite peanut butter and with good reason. I love how many different options Kraft PB comes in like regular, smooth, extra smooth, creamy, whipped and crunchy among others. Peanut butter is great for a snack on toast, apples, in baking and also goes amazingly well with one of my other favourite foods - chocolate. I am happy to tell you that Kraft recently added a brand new flavour to their PB family with new Kraft Peanut Butter With Chocolate! Every PB+Chocolate fan's dream come true! You may have seen the recent buzz on Twitter with the hashtag #KraftPBChocolate! With 50% less sugar than the leading hazelnut spread (only 80 calories per 1 tbsp serving), Kraft PB with Chocolate is a great way to liven up your breakfast routine, enhance your favourite baking recipe or as a spread on fruit or toast for a delicious snack any time of the day. Kraft sent us over a lovely breakfast tray containing goodies and a jar of Kraft Peanut Butter along with some yummy recipes to try for ourselves. One of my favourite ways to enjoy new Kraft PB with Chocolate is simply spread on toast and that is just the beginning. There are so many ways to enjoy new Kraft Peanut Butter with Chocolate. Enjoy a delicious, wholesome breakfast with yummy Peanut Butter Chocolate-Stuffed French Toast featuring new Kraft Peanut Butter with Chocolate! 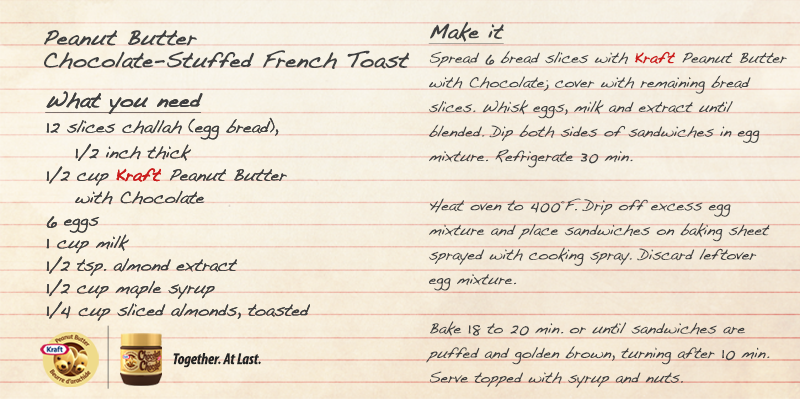 Check out the recipe below and try it yourself, you won't look at French Toast the same way again. Thank you Kraft for introducing us to perhaps our favourite addition to your ever so yummy Peanut Butter family! You can find Kraft Peanut Butter with Chocolate at your local grocery store. To learn more about Kraft Peanut Butter please visit the official Kraft Canada website. 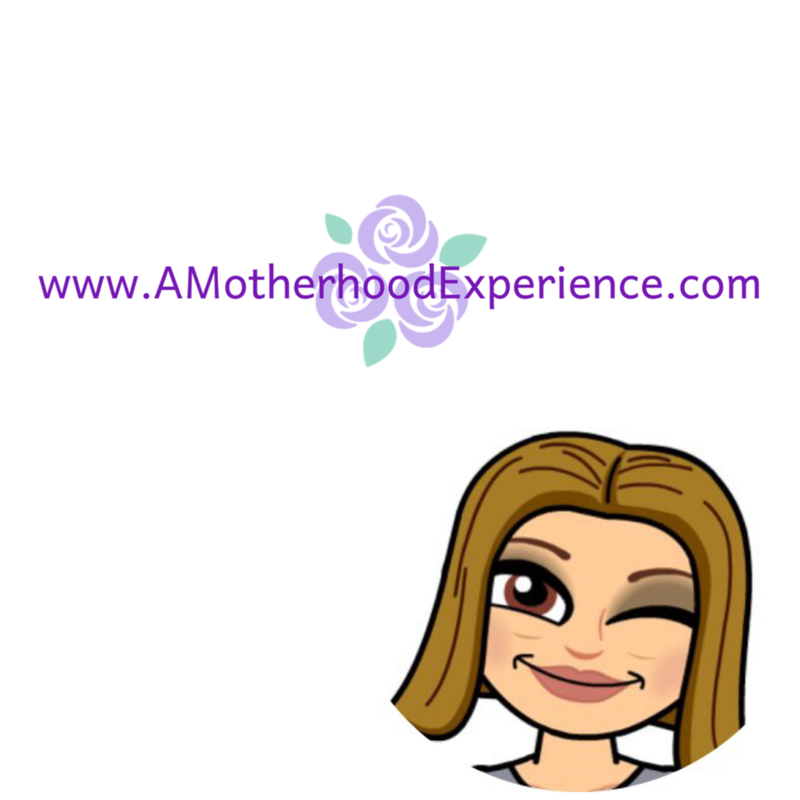 Date Night - Do we or don't we? Take the "Never Say Diet" Oath with Cheerios! Amazing Clubs - The gift that keeps on giving! Disney LIVE presents: Mickey's Rockin' Road Show!